Your first choice in Mobile Entertainment is just a phone Call away! We can provide the right touch to your next great event! We have decades of expearance serving the bay area with our mobile DJ service,Wedding D.J.service and other services as well. K.C. Entertainment has a flawless reputation for offering premium service and there is never a shortage of high energy fun and great music. We cover a service area from our home base of Santa Clara, CA, as far as Humboldt county, to Diamond Springs, to Pismo Beach, to Fresno. We are extremely professional and an established entertainment company. All of our Equiptment is state of the art, including names like Numark,Gemini, JVC, Sony, Peavy, JBL and Megastar for karaoke. We always bring a back-up sound system if needed at any time, so there is never a problem. We are offering D.J.Services as low as $400.00(weddings add $175.00).If your event is in santa clara county,and your venue has easy access to the event area,your price for 4 hours will only be $400.00. With this price you will also recieve your choice of 2 of 6 different party light fx for the evening,as well as free karaoke,and our custom music formatting.There is no set-up fees or transportation fees as well. you can also recieve 20%off any of our additional services we offer,such as our hi-tech lighting fx packages,or Elvis tributes or appearances. The staff at K.C. Entertainment has MC/DJ'd at hundreds of weddings. We thorouly understand that this day, above all, should be as memorable as possible. We offer as our the following services to achieve this, such as.Our basic wedding package starting as low as $575.00 for 4 hours(Example for Santa Clara County). Owner Operator D.J.Rick has 25 years of D.J.as well as entertainment experience to ensue your wedding is not only a success,but entertaining as well. Select from our request list the songs you would like for your wedding,and also up to 30 request that are not on the list,and we will custom design your music to your exact expectations. We have an on staff Wedding coordinator to help you with your schedule,and will attend the reception to keep the schedule on track as well as assisting with announcements or special request. We also offer in-house concultation. Wireless,and hands free mics are also available for use during the ceremony.We have specials on our mobile nightclub lighting fx, or perhaps a spotlight to enhance a special wedding dance. These fx make for a more exciting reception. Like every aspect of our services, these effects are of the highest quality and consist of names such as American D.J., Eliminator, Chavet and Antari. We have 8 different lighting packages to choose from starting as low as $50.00, to fit every price range. Included with our mobile D.J. service, you will recieve 2 of 6 complementary lighting fx from our basic lighting packages to use during your event as well as free karaoke. Another unique service we offer is our custom music formatting. You can select from our list of popular songs requested by our customers from past years. Choose from these songs, or provide us with any other songs you want that are not on this list, and we will custom design your music to your exact needs. This is just another example of our commitment to make your special event as perfect as possible. Although we have participated in many types of wedding ceremonies, we treat every one on not only a personal level, but more to the fact on a family level. We want to be no less than your exact expectations of a perfect Wedding D.J. service. For your visual enjoyment we offer to you our Mobile Nightclub! lighting packages!! They are a must see attraction! The Lighting Presentations can be found on our under movie clips,and then select lighting presentation. We can design everything from a simple Mirror Ball set-up to a light show that will eclipse most clubs! With hi-tech lighting fx, smoke fx, Volcano blast smoke fx, and A light enhancing haze, we can transform any venue into a exciting environment for all ages to enjoy! Our newest lighting edition "The Hightech Lazor and Lightshow" Two hightech editions to our spectatular lighting packages. They will complete any Party with a spectatular display!! For smaller, intimate occasions, we can also supply an 8'x8' black & white checkered dance floor and 6 black & white tables with 24 chairs. We can even supply black accordion walls to enhance the lighting or maybe cover up an area such as a garage work area, creating the perfect party environment. In short, we can put a mini nightclub at your home. Karaoke is your idea of fun? We have a great time waiting for you! Upon request, we can record your songs on a VHS or audio tape for a memory keepsake of a great evening. BUT WAIT !...THERE'S MORE ! ! Let us take you back to the days of wild jumpsuits, and to the shake, rattle and roll of a live tribute show to Elvis, the King of Rock & Roll! 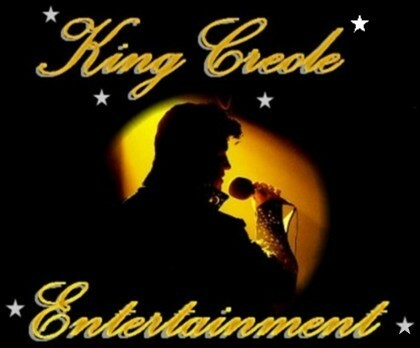 You can have ELVIS at your next event to sing a song or even perform a mini concert! This can be as simple as a few songs at a birthday party or a singing telegram at an office or venue to a full-blown tribute show with all the hi-tech lighting fx. We have 3 different costumes at this time and are in the process of designing more. It's all about a good time! Fun for all ages!